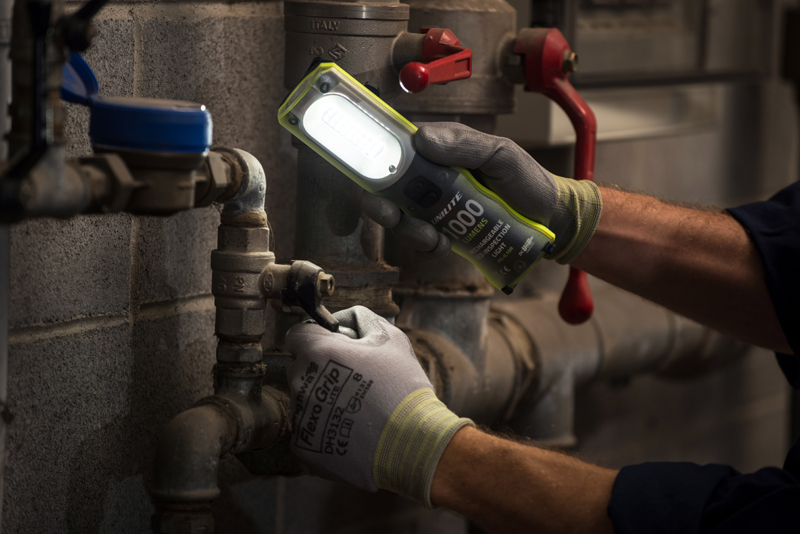 The experts at Unilite explain why quality and reliability are key features of the company’s latest inspection light, the PS-IL10R. Finishing your work as quickly, yet efficiently as possible, is vital for plumbers and heating engineers. The more jobs you can fit into a day, means the more work you get done, leading to increased earnings. So, how can your choice in a lighting tool support you in achieving these aims? One solution is to opt for quality tools over cheaper alternatives. This way you don’t have to keep pausing to recalibrate; delay work to go and grab a replacement when one breaks; or in the case of torches, have to resort to using the dim flash on your phone when your torch fails. What type of light for me? Lights with SMD LEDs (Surface Mounted Diodes) are generally the most suitable for tradespeople, as they have better runtimes compared with other LEDs. When these are put into a high-quality inspection light, the results are impressive. This combination has been brought together with the latest Unilite inspection light; the PS-IL10R. It has 27 SMD LEDs, which produce 1000 Lumen of lighting power. Installers have found this to be the perfect amount for most tasks. In addition, it has a 250 Lumen spot beam on its head that’s great for tasks that require an intricate beam. The light emitted from the PS-IL10R is also suitable for long term use and won’t cause eye strain. This is because it has a colour temperature of 6500k (kelvin), which is the optimum working light for prolonged use. Why do plumbers like the PS-IL10R? The PS-IL10R offers multi-positional placement options. With a foldable kick stand that can be positioned to shine directly on the job at hand and a magnetic hanging hook, which can attach directly to a boiler, the light can be placed almost anywhere, making life easier while working. Its case build quality is also important, as it needs to withstand daily use. That’s why the IL10R is made from a blend of ultra-strength aluminum and polycarbonate, which keeps its electronics safe and out of the way of harm, ensuring its integrity. With a USB rechargeable Lithium battery, IP54 ingress protection and its three individual dim settings, we believe the PS-IL10R is, and will continue to be, popular with plumbers and heating engineers alike.